Okay, so this was the class that I signed up for just because they gave a price break if you signed up for the whole week's worth of classes. I'd already decided to skip the afternoon session, unless it was just really splendid, because along with the classes, they gave us a week's pass to the Senate House Library. Unfortunately, it closes 30 minutes before we get out of class. So, wow, hey, cool, I have a pass to the best paleography library in the English speaking world, but I can't use it because I am in classes. (Passes are about $10 a day.) And indeed, I did just attend the morning classes. Some interesting tidbits though. Where did a backward little country like England come by such stuff? Well, after the Normans invaded in 1066 (no, no, I can tell you are thinking about the Saxons. The Saxons invaded England in yesterday's classes. Today you should be picturing Errol Flynn as Robin Hood, being called, "Saxon dog" by his arrogant Norman French overlord. Okay, are you with me?) So after the Normans invaded, they started stocking the libraries in their newly acquired monasteries. Conveniently the first Crusade in 1098 had created a big boom of Arabic used books. The Spanish King had also loosened up a bunch of texts by kicking out all the other religions, except for Christianity. So a crap-load of medical texts, math books, and first year geometry books started making their way across Europe. Who first managed to do math with the aid of the number zero? Also, who introduced the zero to England? These are not exactly who I thought they would be. So the Indians invented math with a zero, and the Muslims got it from them, and then we got the zero as part of the whole Arabic number set. But surprisingly that wasn't a completely new thing. The Romans had a zero, they just used it to mean... well... zero. They didn't do fancy-schmancy algebra stuff with it. (For everyone who's dying to know, it looked like an o with a hat on it, or an o with a slash through it. So Where Did the Professor Lose Me? I decided I wasn't coming back after lunch after he made us read the second manuscript aloud in Latin that explained how to do multiplication using Roman numerals. Many people found it a lot of fun, but I was starting to have to pinch myself to stay awake. While standing and looking at the washers and dryers last night, I spotted several bottles of laundry detergent. There was a lady at one of the ironing boards so I asked, "Are we allowed to use those?" She said she didn't know whose they were, but she would loan me some of hers. She ran up to her room and came down with two Evian water bottles full of detergent and fabric softener. What a nice person. Her name is Ann, she's from the Virgin Islands and is here for a month course. Later today, after an hour of the librarian at Senate House Library grabbing random experts who happened to be walking through the library and forcing them to help me, a lady overheard him tell me I should go to the Warburg Library. She came over and said, "I'm walking over to the Warburg right now, do you want me to show you where it is?" So, like the good Midwesterner that I am, I said thank you and accepted the kindness. Once I arrived at the Warburg they gave me a slip to fill out, but I couldn't finish the form since they wanted to know whether I was faculty or a PhD student. (They don't let Master's students in.) When I got to the desk I looked as trustworthy as possible, and they said, "Oh that's all right. We'll just give you a temporary pass." All in all, I'm finding London a friendly place. Well, after the librarian grabbed Dr. Ganz, one of the speakers from yesterday, and made him listen to my questions about the funny little section marks on my lullaby manuscript, (The one I'm doing my thesis on! Do keep up!) I had some success in locating a bunch of examples of similar signs in a couple of books. However, by that time, the library was closing and the nice lady was offering to take me to the other library. So the librarian stashed my pile of books in a corner, and promised not to re-shelve them. I'm going to get up early and go back over tomorrow morning. How I'm going to sort through 3 books and a 12 volume encyclopedia of Latin hymns in 30 minutes, I don't know. But I'm going to give it a try. Perhaps I'll look pitiful again. The train had 8 million people on it, and I wedged myself, sardine like between a woman with a purse and a man with a backpack, then tried hard not to step on the toes of the woman wearing little black flip flops who was sitting so I couldn't really see her. Very warm, very aromatic. However, surprisingly easy to navigate around in. Everything is excruciatingly well marked. One would just have to willfully be trying to get lost, to miss one's stop. Well, I arrived too late to go on the grounds. Take a look at the photos. That's pretty much what I saw. It's kind of a touristy area, so everything is clean and nice. I got the feeling that if I yelled, several off-work bank tellers would pile out of the nearest coffee shop or champagne bar and bash my assailant over the head with a "Back the Bid" coffee mug. (Britain is bidding on the Olympics for 2012, and that's their slogan.) As you take a peek at the photos, remember that this is at 9pm at night. The sun rises about 4 and doesn't go down till well after 9:30. 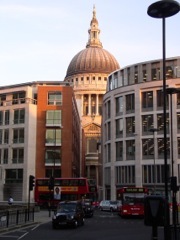 A Cathedral dedicated to St Paul has overlooked the City of London since 604AD, a constant reminder to this great commercial centre of the importance of the spiritual side of life. The current Cathedral - the fourth to occupy this site - was designed by the court architect Sir Christopher Wren and built between 1675 and 1710 after its predecessor was destroyed in the Great Fire of London. Its architectural and artistic importance reflect the determination of the five monarchs who oversaw its building that London's leading church should be as beautiful and imposing as their private palaces. As the Cathedral of the capital city, St Paul's is the spiritual focus for the Nation. This is where people and events of overwhelming importance to the country have been celebrated, mourned and commemorated since the first Service took place in 1697.